This is part three of a three part series. Check out part one, 5 Things to Make Your SLP Graduate School Application Stand Out, and part two 10 Things to Do Before Starting an Online Graduate Program in Speech-Language Pathology! Starting your first clinical placement can be a nerve-wracking experience. You are wondering what to expect, how you’ll get along with your supervisor, if you know enough to do well (you do), and the list goes on. 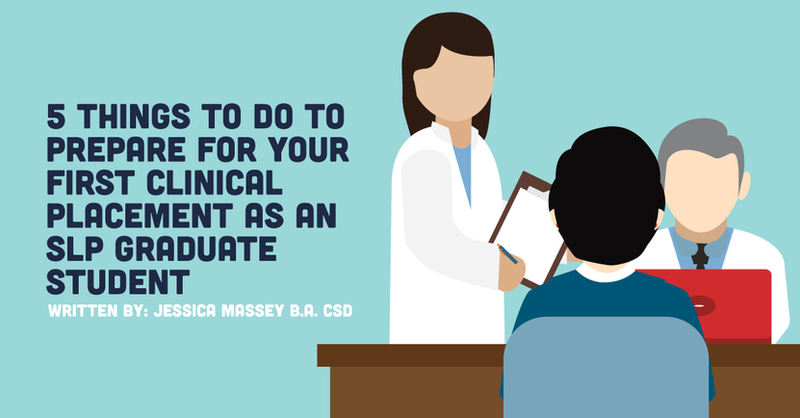 We have put together a list of five things that you can do to prepare for your first clinical placement. If possible, try to meet your supervisor prior to starting your placement. Speaking from experience here, not only does this give your supervisor a good first impression of you because you are taking initiative and showing interest, it can also calm your nerves if you've already spoken with them before starting. It's comforting knowing that when you walk in, your supervisor’s voice will be at least a little familiar. This can be a brief meeting just to introduce yourself, but it is extremely helpful for keeping nerves at bay. Plus, the relationship that you build with your supervisor can lead to having an amazing mentor as you continue on your path as an SLP. Knowing what to expect before you arrive on site will relieve you of unnecessary stress and allow you to start your practicum more focused on the learning experience itself. You'll want to get information on simple things like dress code, parking, and any documentation or requirements that you need to have completed before starting. Having all of this information lined up ahead of time lessens the stress of starting at your new site. You can go into your first day knowing that you are dressed appropriately and prepared with the required paperwork. I’d also recommend asking your supervisor what to bring with you. Most of the supervisors that I have worked with have requested that I bring my laptop since they prefer to take data digitally. Which brings me to the next point. Know how you’ll record data. Tracking data efficiently is crucial in the field of speech-language pathology. Chances are that your supervisor will have a specific way that he or she tracks data and they will want you to learn it. I did, however, have one placement where the expectation was for me to take data in my own way and present it to my supervisor. I frantically tried to come up with a method to effectively take data in a group setting (since I had previously only had experience with clients one on one). If I already had an idea of how I planned to track data during sessions, then I wouldn’t have been stressed out while trying to figure something out on the spot. As SLP students, we are learning communication information that spans across all ages. Before you start at a new site, make sure that you are up to date on foundational knowledge regarding the age group you will be working with. My first placement was at a private practice that served children, mostly ranging from ages two to ten. I reviewed my coursework that included assessing, diagnosing, and treating early childhood and school-aged children, and we have some tips for SLPs that work in early intervention here! I’m not saying that you need to reread your entire textbook, but you do want to show up having brushed up on key points so that you can confidently have professional conversations with your supervisor. Part of being a student clinician is being regularly critiqued. Make it a point to mentally prepare yourself for receiving constructive criticism from your supervisor. This seems like a no-brainer, but the first time that my supervisor critiqued one of my therapy sessions I was caught off guard. Her advice was extremely constructive, and she helped me come up with a plan of action for improvement, but it caught me off guard nonetheless. I had previously worked as a speech-language pathology assistant and was used to doing therapy a certain way, so the critique felt sudden. Nobody is a perfect clinician, and that's okay! This is doubly true as a student; you're here to learn. Approach each meeting with your supervisor with professional poise and don’t be afraid to ask for clarification or help in creating a plan of action for improvement. Go into each clinical experience with an open mind, ready to learn, and prepared to do your best. The more prepared that you are, the less stressed you will be which will provide the best possible experience for both you and your supervisor. Now get out there and tackle your first clinical placement with confidence and tell us how it goes!